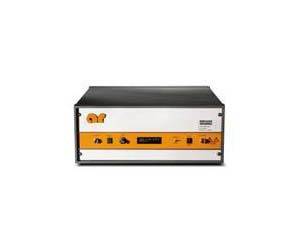 The Model 50S1G4A is a solid state, self-contained, air-cooled, broadband amplifier designed for applications where instantaneous bandwidth, high gain and linearity are required. Housed in a stylish contemporary cabinet, the unit is designed for benchtop use, but can be removed from the cabinet for immediate equipment rack mounting. The 50S1G4A, when used with a sweep generator, will provide a minimum of 50 watts of RF power. Included is a front panel gain control which permits the operator to conveniently set the desired output level. The 50S1G4A is protected from RF input overdrive by an RF input leveling circuit which controls the RF input level to the RF amplifier first stage when the RF input level is increased above 0 dBm. The RF amplifier stages are protected from over-temperature by removing the DC voltage to them if an over-temperature condition occurs due to cooling blockage or fan failure. There is a digital display on the front panel to indicate the operate status and fault conditions if an over-temperature or power supply fault has occurred. The unit can be returned to operate when the condition has been cleared. The 50S1G4A digital panel provides control of all amplifier functions both locally and remotely via IEEE-488 (GPIB) or RS-232 interfaces. The low level of spurious signals and linearity of the Model 50S1G4A make it ideal for use as a driver amplifier in testing wireless and communication components and subsystems. It can be used as a test instrument covering multiple frequency bands and is suitable for a variety of communication technologies such as CDMA, W-CDMA, TDMA, GSM etc. It is also suitable for EMC Test applications where undistorted modulation envelopes are desired.